It’s that time of year again! Time to get out and enjoy nature, from the back of your favorite off road vehicle. 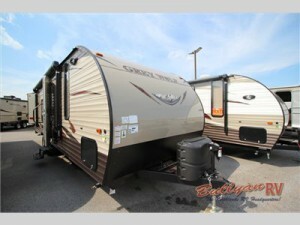 And if you don’t want to lay your head down on the hard ground after a long day, you need to take the Cherokee Grey Wolf toy hauler travel trailer with your on your next adventure. It’s a great way to haul your toys and relax in style and comfort after a long day on the trails. The Cherokee Grey Wolf toy hauler travel trailer. The cargo area turns into a great extra living space once you unload at your destination. In the cargo area you will also find two fold down sofas and a dinette table. You can even choose two optional lounge chairs. 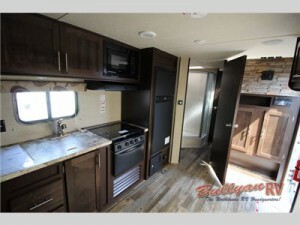 The main part of the Grey Wolf toy hauler travel trailer boasts a great kitchen. There is a sink, three burner stove with oven, microwave and great size fridge for all the food and beverages you will need to keep up with your adrenaline filled fun. Relax and refuel in this great interior! As you head off to get some much needed rest, stop off in the walk-through bathroom and get cleaned up. There is a corner shower with vanity and medicine cabinet on one side and a toilet and linen storage on the other. Once you enter the bedroom, sink into the comfy queen size bed for a great nights sleep. There is plenty of storage for all of your gear in the two wardrobes and extra overhead storage. The Cherokee Grey Wolf toy hauler travel trailer is a great, relaxing way to travel with your friends and you favorite off road toys. Contact us today to pick a floor plan that is right for you!